Dale, Dave, and Ed went to dinner at Luigi's Restaurant in Two Rivers after arriving at Manitowoc. As we were waiting for a table, Mark Henderson sitting with his family, says I saw you on Keloland TV the other night. The Henderson's are from Sioux Falls SD, and vacationing in Manitowoc WI. What are the chances of them and us meeting in Manitowoc WI! 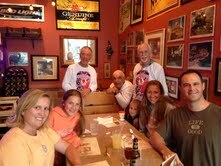 After dining we went over to Pic and Save to get some supplies and run into the Hendersons again!